Long have I been (ahem) putt off by the vast land staked by the world’s golf courses. Thanks to the impeccable Tiger Woods for technicoloring this pastoral tradition and also to the steady growth in the women’s game, the direction of this “gentlemen’s'” (read frat boys’) clubhouse sport seems to bear no light at the end of its tunnel vision of land (mis)management. I regard it with hostility for it’s waste of space and- especially in Arizona- misallocation of our precious water resources. Now, this isn’t to say that all golf courses should be scraped and repurposed, or that this oversized bowling green for good-old-boys croquet should be abandoned, but it sure would be nice to take back a couple of these large parcels of land and rough ’em up a bit, say, re-scape them for multi-purpose recreation? How lovely a background (FOREground) would this provide for the Freerunner with a propensity for the aesthetic? I’m also not suggesting any sort of protest or revolt against the grandfathered past time of golf, but if and when a course is freed of its slave drivers and iron shackles I’ll be there in earnest to stake some turf. 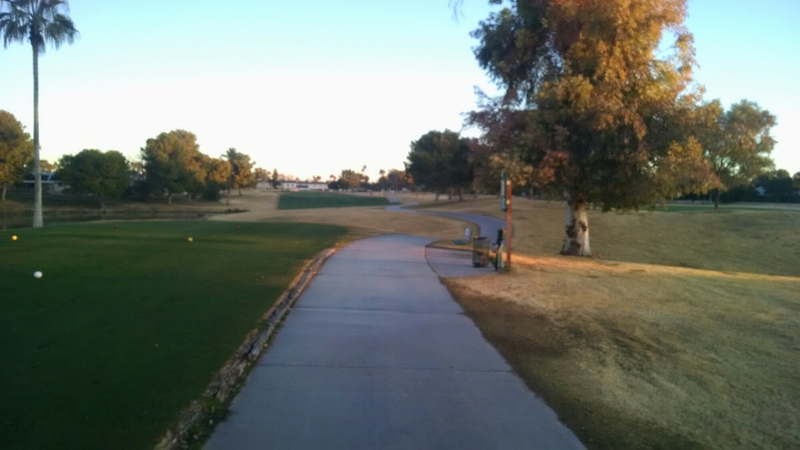 Below is a trace in and around the greens of Ken McDonald Golf Course in Tempe. The view in the video is taken in the morning at sunrise. My intention for depicting this circuit is to promulgate the vision I have for these one-dimensional properties as a multi-recreational greenscape, one that could be shared with Freerunners. 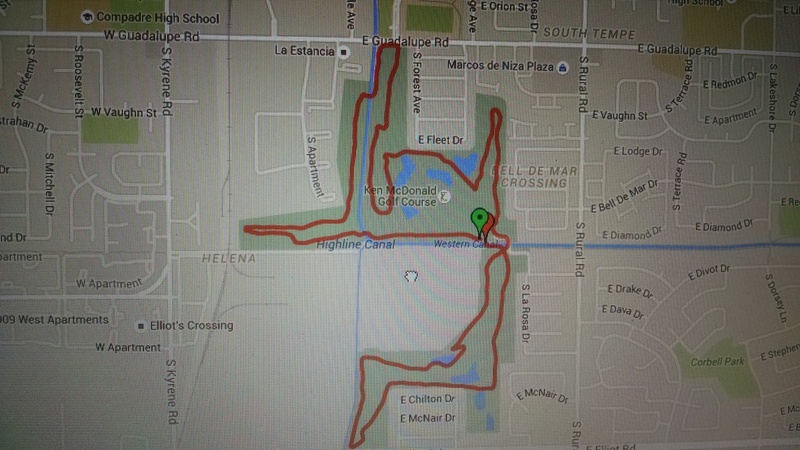 This trace revealed a lovely 4.5 mile run that could be shortened or stretched however one sees fit. But, alas, for now, it will remain the domain of golf carts shuttling around groups of four or less every 15 minutes to poke a small white dimpled ball around a well-groomed yard.